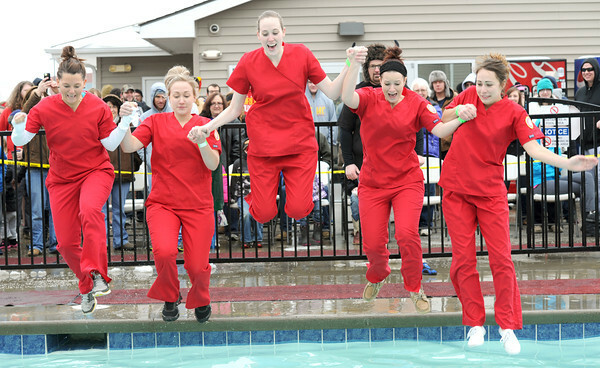 Representatives from the Irene Ransom Bradley School of Nursing at Pittsburg State University prepare to hit the icy waters at Crimson Villa in Pittsburg on Saturday during the Polar Plunge to benefit Special Olympics. From the left : Samantha Rasdall, Paige LaBlank , Jordan Bain, Samantha Hlinicky and Courtney Corder. More than $35,000 was raised from the plunge, a morning run and a chili feed. Organizers said 187 people took the plunge on Saturday.